Men's Long Sleeve T-Shirt is in stock. We will print it as soon as you order it. 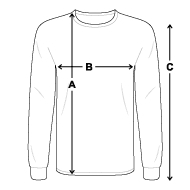 Great for tossing around the pigskin in the fall or for layering in the winter, this long sleeve t-shirt should have a place in every man’s drawer. The heavyweight fabric makes this item a versatile must-own for every season — it’s not too light for chilly days, and not too heavy for the warmer ones — it’s just right. Imported; processed and printed in the U.S.A. I intentionally ordered it too big, for a cozy fit. Its everything i wanted, i feel great wearing it! Very good quality and fit.